And this is just one of many American cities where it feels like we're still just getting started. Big, bold, and crowded as ever, Atlanta is best appreciated in manageable doses, small bites. Stroll or cycle along the expanding BeltLine trail, spend an afternoon at one of the city's very nice public markets, or even just a few hours spent tasting at a new brewery. There is so much to see, but you will not do yourself any favors, trying to see it all. Not all at once, anyway. Sometimes, however, it pays to buck up and spend a few days throwing yourself at the city, letting it carry you in all directions. Ever growing, ever changing, there are few cities in the Southeast this consistently exhilarating, and as long as you can stand the driving, Atlanta is one of those towns (and there are plenty of them, here in the United States) that always ends up rewarding the adventurous, the ones who don't mind putting in the work. 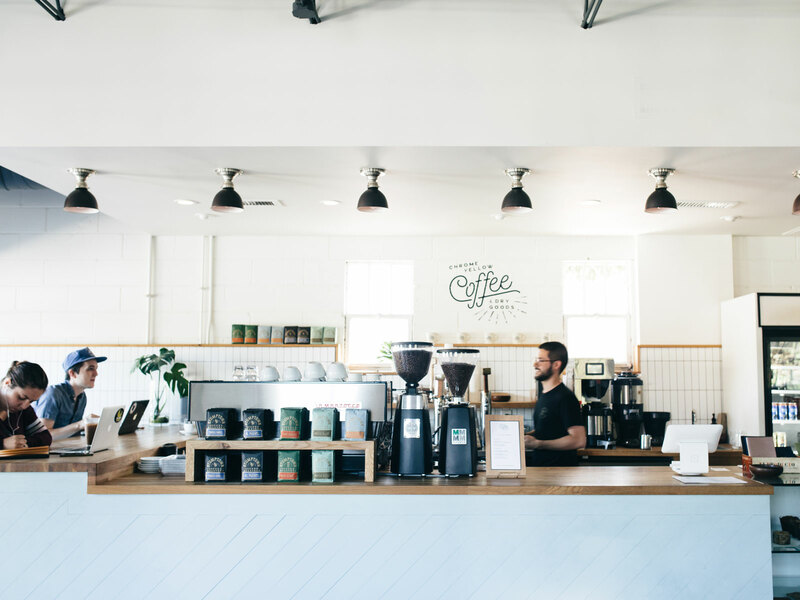 Very recently, I dropped by to check up on a couple of new developments, and instead found myself, quite by accident, immersed in a weekend-long crawl through Atlanta's increasingly layered coffee culture. This is a crawl I have done many times before, and while things were for years just a little bit too static, there has recently been so much change. Old names snapped up by new names, popular addresses adding more locations, restaurants like Momonoki and 8Arm branching out with their unique takes on the modern coffee shop experience. There's a lot of hype in the mix, which is not likely to surprise anyone even marginally familiar with Atlanta, and getting past the noise to find out what's actually good requires some effort, but that's okay, because doing the legwork is actually a great deal of fun. How could it not be, when there's coffee at every stop? Let's play favorites, shall we? Here are five current musts. Jared Karr's hitting-every-note roaster and café operation opened just one year ago in the semi-hidden (but so worth seeking out) Armour Yards enclave. From the start, Karr's passion, acquired while spending a good amount of time in Indonesia, along the quality of his coffee, was impressive enough to catapult him past all competitors in Georgia to earn the number one spot on our Best Coffee in Every State list, for 2018. Two visits this past weekend affirmed that decision, and then some. This is one of the best-looking shops in town, but the hospitality is warm, the drinks flirt with perfection, and the lack of pretense is completely refreshing. Roasters working at this level do not always put the good bean on drip, if they even offer such a thing; here, a far-from-simple cup of coffee—a bright, rich Peruvian one day, a delicate Ethiopian the next—will likely be a highlight. West Coast expat and longtime NPR producer Chip Grabow began roasting coffee at home, just to learn, and over time he has managed to grow a side project into this very good small business, one well worth seeking out, even if that means memorizing the one-room roastery's somewhat limited opening hours. Just around the corner from the local icon that is the Dekalb Farmers Market, way out past Decatur, this isn't really a café; there's one table in the middle of the room with a handful of stools. Still, Radio's Saturday morning open hours are a must for any coffee lover. The whole thing is very informal—have an espresso and sit yourself down, right next to where Grabow himself will probably be working, and ask for take-home recommendations, which he will gladly bag up for you. In the past, I found myself wishing Radio would open an actual shop. This might be better. Our Saturday tradition continues. Swing by for coffee...in liquid or whole bean form. 10-noon. Near #dekalbfarmersmarket or #yourdekalbfarmersmarket if you’re not into the whole brevity thing. The best shot of espresso I tried all weekend, and there was heavy competition, came from the Modbar setup at the Buckhead branch of this two-shop operation. Brash blew onto the scene back in 2015, operating out of a converted shipping container in an area known as the Westside Provisions District. Known for keeping exceptionally close ties to the farms they source from, if you are not a fan of Central American coffees, one shot of the Pacamara varietal from Las Delicias Farm in El Salvador, owned by Miguel Menendez (they're really into the backstory here) will convert you, just like that, and remind you that so many roasters (and so many baristas) still have a great deal to learn about balance. The shipping container is still there, while the Buckhead location is found just off of the lobby of the Atlanta History Center, currently home to a very fine exhibit dedicated to the history of barbecue. Atlanta's Old Fourth Ward is perhaps one of the most compelling neighborhoods in the region, right now—steeped in history, but out there on the cutting edge, too. Just around the corner from the legendary Ebenezer Baptist Church, the birthplace of Martin Luther King, Jr., and of course The King Center, you will find one of the city's coolest cafes, a pretty bit of Instagram bait with lots of counter seating and a snug outdoor patio. Chrome Yellow serves Stumptown, but when I visited, they were also sourcing from one of the Southeast's best roasters, Methodical, up in South Carolina. "The Methodical isn't really dialed in right now," the barista apologized, letting me know she'd be happy to play around with it a bit, once she powered through the rush. Grateful for her candor, I opted instead for a pour over, done with great care, of Methodical's Rwanda Kanzu. Expensive at $6, but I was not disappointed.